Are dentists extracting extra revenue with unneeded X-rays? The cost won’t exactly break the bank. But it might equal what you will pay for the oral health care that prompted the visit. When the dentist starts saying it’s time for partial or “bitewing” X-rays, just say no, a health care economist recommends. Austin Frakt, an expert writing in the paper’s Upshot column, hit a nerve with hundreds of New York Times reader-commenters when he noted that no less august a group than the American Dental Association recommends that bitewing X-rays should be taken sparingly and probably not annually, especially for an otherwise healthy (dentally speaking), recurring, adult patient in a practice. But as Frankt pointed out, too many dentists have made these X-rays part of the yearly cleaning regimen. He says, in passing, that insurers often cover this procedure, which can cost as much as the cleaning−effectively doubling the per patient revenue for practitioners. But as a dentist who has consulted with Consumer Reports observes, bitewing X-rays are simply over-used−and he has campaigned against this for years. What’s more revealing, perhaps, is Frakt’s observation, with many reader comments to back him up, that dentists’ and their hygienists’ persistent, pervasive pushing of procedures like bitewing X-rays rankles patients. They look askance at their dentists, finding X-ray up-selling akin to car salesmen huckstering unneeded under-coatings on a new vehicle. As one angry reader wrote to The Times: “Dentists are up there with auto mechanics and tow truck drivers as the most corrupt professions.” Other comments also reported that dental practices have forced them to sign written waivers when forgoing bitewing X-rays. I’ve written before and recently about unnecessary medical procedures, and how evidence-based research has led practitioners and patients away from annual physicals, routine prostate cancer testing, too frequent mammograms, and to reconsideration of regular pelvic exams for otherwise healthy women. It’s sad to see that there may be yet another category for dental over-treatment. 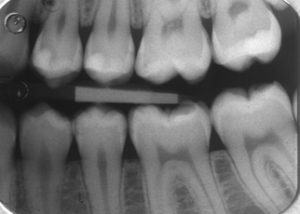 A West Coast colleague, with so many dentists as such close friends they’re almost family, points out that dental insurance adds to patients’ dissatisfaction with their oral health care: Yes, it covers procedures like bitewing X-rays. But coverage has gotten so costly that patients can see how annual premiums far outpace any benefits received; if patients do need extensive and expensive dental work, it often isn’t covered by policies with tight annual payment caps. Many dentists, meantime, won’t take on patients without insurance, and their charges for procedures for the uninsured (or for uncovered work) can be steep. Dentistry is an important part of the health care system, and dental disease is a serious health issue. Four in ten poor Americans suffer from untreated tooth decay, according to some researchers. Better dental care helps low-income people in a range of ways, from avoiding emergency rooms, to having healthier pregnancies, and even succeeding in the job market.